Engineered for 2017-2018 Chevrolet Silverado models, K&N® performance air intake systems offer a guaranteed increase in horsepower and torque for Chevy Silverados—featuring a washable performance air to help protect against engine contaminants, and an aerodynamic tube design that increases airflow and provides a boost in power. 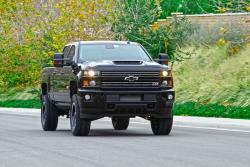 The 2018 Chevy Silverado 1500, 2500, and 3500 models are consistent with the classic American brand’s reputation for quality engineering. Good towing capacity, masculine design, and powerful engine options help distinguish the Silverado from the crowd. If you’re looking to boost the horsepower in your Silverado, consider a K&N performance air intake system—designed to keep airflow to your engine cool, efficient, and smooth. Many factory intake systems have baffles and other components that can obstruct airflow, create turbulence, and subsequently create heat, resulting in less efficient engine combustion. By replacing the full stock system with a more aerodynamic tube and High-Flow Air Filter™, the engine receives a greater volume of airflow—giving you a guaranteed increase in performance. In a typical factory air intake system, air must first pass through a restrictive disposable paper filter before traveling through a complex system of tubing—often featuring tight bends, baffles, and other airflow obstructions—that can cause air to swirl and become turbulent. Excess turbulence causes the molecules within the air to collide, which subsequently increases the temperature and lowers the density of the air, reducing the efficiency of engine combustion. K&N intake tubes are engineered to give the airstream a smooth, unobstructed path—keeping engine air cooler, and increasing the amount of oxygen available for combustion. Typical stock disposable filters are only able to “surface load”—dust collects on the surface of the media, which over time reduces the filter’s ability to allow a high volume of airflow to pass through. High-Flow Air Filters™ feature a “depth loading” design, in which multiple layers of cotton fibers allow for particle capture on multiple levels, without significantly reducing the efficiency of the filter itself. In addition, a pleated design helps increase surface area—allowing for significantly greater contaminant capture per square inch of media over a typical paper filter. The oversized, conical shape of the filter included with K&N intake systems allows for a service interval of up to 100,000 miles between cleanings (under normal highway driving conditions). When the filter does need to be serviced, you can use the K&N Recharger® Kit (99-5000 or 99-5050) to quickly and easily restore your filter’s performance. Each intake and filter is designed to last for the life of your vehicle. High-Flow Air Filters™ feature an oiled, layered design, and are available on all K&N intake systems aside from the Blackhawk Induction™ systems, which have a filter composed of synthetic, non-oiled media. K&N intake systems also feature a custom powder-coated steel heat shield, which helps protect the air filter and intake air from high engine temperatures. The heat shield installs onto the lower factory air box and retains the fresh air inlet. 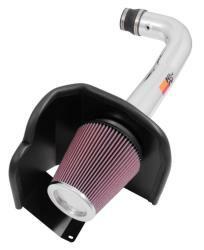 K&N cold air intake systems are designed to incorporate factory mounting points and the factory mass air sensor. Installation can typically be completed in 90 minutes or less, and requires only simple hand tools. Detailed instructions are included in your kit, and installation videos for many vehicles are available on the K&N website. For many vehicle applications, multiple options of K&N intake systems will be available. 69-Series and 77-Series intakes feature mandrel-bent aluminum intake tubes, while 57-Series and 63-Series intakes have high-density polyethylene intake tubes. 71-Series intakes are from the Blackhawk Induction™ line, which feature a black powder-coated aluminum intake tube and a black oil-free synthetic filter. Please view the specific product pages for details on each intake type. After installing your new K&N air intake system, you can look forward to a guaranteed increase in horsepower and torque. On a chassis dynamometer, a 2014 Chevrolet Silverado 1500 4.3L with the stock air intake was recorded at 243.50-hp at 5,285 RPM, and after installation of the 77-3085KP the same vehicle was recorded at 253.52-hp at 5,285 RPM—an estimated increase of 10.02-hp. The torque was also improved from 239.66 lb.-ft on the stock air intake to 253.20 lb.-ft with the 77-3085KP—a total estimated increase in torque of 13.54 lb.-ft at 3,548 RPM. You can buy with confidence under the 10-Year/Million Mile Limited Warranty, and the assurance that you’re receiving a top-quality, extensively tested product. *Use K&N’s vehicle application search to view the most up-to-date part numbers by following this link: knfilters.com. Horsepower gains vary among products and applications, but each K&N performance air intake system is designed to increase airflow efficiency for specific vehicles and their engines. Each kit undergoes significant testing to help ensure that the filter and intake tube are positioned to deliver large increases in airflow and horsepower. Please visit individual product pages to view horsepower estimates for your specific vehicle. Visit knfilters.com to explore air intake system options for your specific vehicle, and join the millions of customers who trust K&N to help them boost performance and protection in their vehicles. Are K&N® performance air intake systems or RK-series custom air cleaner assemblies emissions legal in the U.S.? 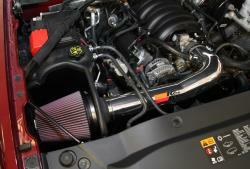 How much horsepower does a K&N® cold air intake add?